When consumers were asked which service they would cut first if they had to save money, a whopping 76% said they would get rid of their pay-TV service. Cable subscribers are as mad as hell, and maybe -- just maybe -- they finally aren't going to take it anymore. To consumers, it can feel like bills for cable, Internet and wireless just keep going up. And they're right, according to a recent report from Macquarie Capital analyst Kevin Smithen. If you had to save money, which of these would you cut first? The cost of those "triple-play" services has jumped about 6.3% on an annual basis for the past three years, a time when overall inflation was running barely 2%. Compounded, those three years of price hikes have added up to a scary amount of money. Smithen's research showed the bill for triple-play jumped an incredible 20%, or about $46, since 2010, to a current average of more than $273 per month. Those rapid rate hikes are "unsustainable in the long run," Smithen wrote. Those price hikes are at the core of a recent slew of major disputes between cable companies and broadcasters. Last week, CBS (CBS) blacked out its channel for Time Warner Cable (TWC) customers after the cable provider refused to meet the broadcaster's rate increase demands. It's very clear where consumers are drawing the line. When Macquarie asked consumers which service they would cut first if they had to save money, a whopping 76% said they would get rid of their pay-TV service. The remaining 24% were split evenly between broadband Internet and wireless phone service. Ian Olgeirson, a telecom analyst for SNL Kagan, isn't surprised that pay-TV was the overwhelming winner (or loser, depending on how you look at it). "[Cable] is really the perfect lightning rod for consumer dissatisfaction," Olgeirson said. "It's the biggest part of your bill and the most consistent rate increase." Plus, he added, it's tougher to replace your cell phone or Internet provider than it is to find an alternative for pay-TV, which faces a long list of semi-competitors: Netflix (NFLX), Hulu, Amazon (AMZN) and many more. But he's not convinced they'll become "a significant threat to the [cable] subscriber base" over the long term. "What's not there is all the content -- the newly aired shows, the sports, the live events," he said. "Content stands to stay in the environment willing to pay for it, and for the foreseeable future, that's the pay-TV industry." 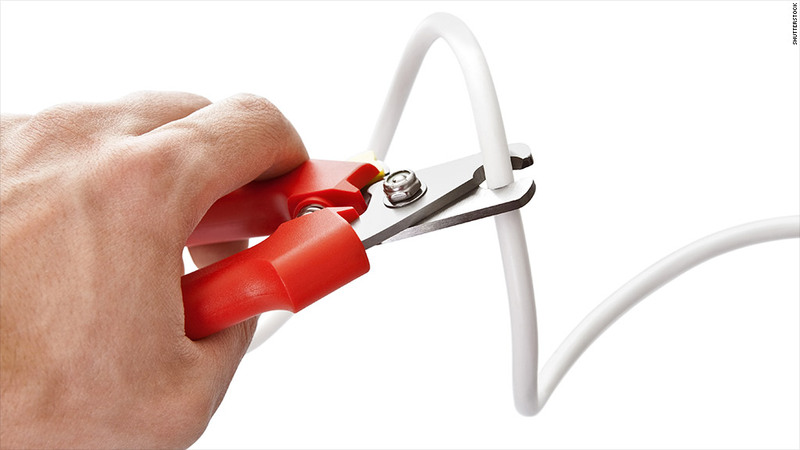 Even Smithen, the Macquarie analyst, stopped short of making "a bold call on cord cutting over any specific period of time." But with such steep price hikes, the tipping point for widespread cord-cutting may be closer than ever.